Lammas is August 1, so today (Lammas Eve) is Juliet’s birthday. Romeo and Juliet was one of Shakespeare’s earliest plays (written some time between 1591 and 1595). It was a popular audience pleaser throughout his career, and remains one of his most popular plays down to this day. The plot, concerning “star-crossed lovers,” is virtually timeless in the Western world. Shakespeare’s play is based on an Italian tale, translated into verse as The Tragical History of Romeus and Juliet by Arthur Brooke in 1562, and retold in prose in Palace of Pleasure by William Painter in 1567. 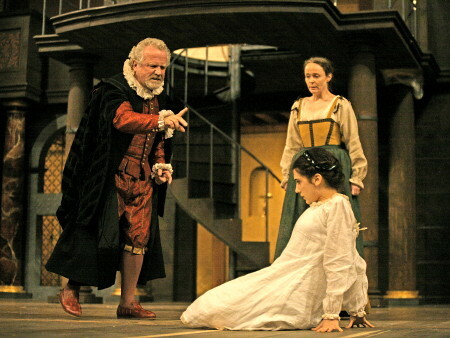 Shakespeare borrowed heavily from both, but added several characters, such as Mercutio, to give the story line more depth as well as to be able to inject comedy into the tragedy. His development of the personalities of the main characters is also distinctive. Here I will focus on Juliet who stands out from all the rest. Juliet’s age (13) was at one time given little emphasis in modern stage productions because the part was played by fully adult women. In such productions the complexity of Juliet’s character was obscured. When Katharine Cornell played Juliet in 1893 she was 41. Most of the famous 20th century Juliets were in their late 20’s and early 30’s. Franco Zeffirelli astounded the world when he cast 16 year old Olivia Hussey for his 1968 film –rather a bold move given that in his 1960 London stage production he went with convention and cast a 26 year old Judi Dench. With Hussey appearing as a convincing 13 year old the whole tenor of the play was transformed. The focus shifted from thwarted love in general to the multifaceted nature of Juliet’s character. She is both a naïve girl and a mature woman. The play is set two weeks before Juliet’s 14th birthday. Count Paris comes calling, asking Juliet’s father, Lord Capulet, for her hand in marriage. Certainly in noble houses in Europe at the time, girls marrying at 14 was not unheard of, but 16 was more usual. The common belief in Elizabethan England was that motherhood before 16 was dangerous. Popular manuals of health, as well as observations of married life, led Elizabethans to believe that early marriage, and its consummation, permanently damaged a young woman’s health, impaired a young man’s physical and mental development, and produced sickly or stunted children. (Shakespeare married at 18). Given that Romeo and Juliet was written for an English audience, Capulet’s initial response to Paris that he should wait two more years would have been in keeping with general norms of the time, and the idea of a 13 year old girl marrying would have been as difficult for them to accept as it is for modern audiences. But Juliet would have been played by a boy actor, so the representation of her as a young girl would have been easier for Shakespeare than for modern companies. Juliet was first played by a woman, Mary Saunderson, in the 1660’s after the laws forbidding women on stage loosened under Charles II. 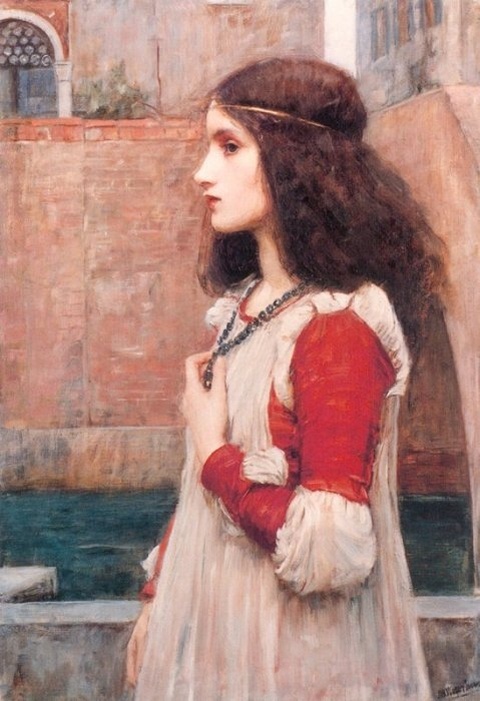 Shakespeare’s Juliet is a headstrong and intelligent character in spite of her young age, though she sometimes reverts to a passive, docility out of respect for her parents (and sometime to deceive them). She is considered by many scholars and critics to be the true hero of the play, acting as a sounding board and a balance against the impulsive Romeo. It is Juliet who sets the boundaries of behavior in her relationship with Romeo: she allows him to kiss her, she pledges her commitment before him, and it is she who suggests their marriage. Her sexual directness and desire have won her praise by modern feminist critics. Juliet’s forgiveness of Romeo after he kills her cousin Tybalt indicates her mature nature in contrast to his passionate impulsiveness (and that of all the men in the play). Her philosophical musings, especially during the balcony scene, are astute and apt. Furthermore, Juliet lies and clandestinely subverts her family’s wishes, a truly rebellious action against traditional Italian society. These actions, and the choices they require, establish Juliet as a far more complex character than her family, or even Romeo, appreciate. For Elizabethan society Juliet was a truly subversive and revolutionary role: she undermined the very foundations of patriarchal culture. All the characters (male and female) in Romeo and Juliet play out conventional Elizabethan roles, except Juliet. She is a rebel. For today’s recipe I have chosen Mock Pears (my name) adapted from Shakespeare’s Kitchen: Renaissance Recipes for the Contemporary Cook by Francine Segan. This is a kickshaw (Anglicized from the French – quelque chose, meaning “something), that is, a curious trifle. 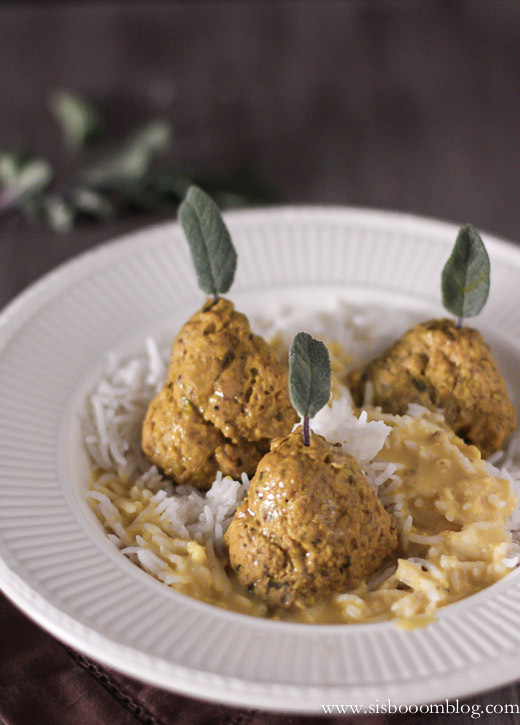 These pear-shaped meatballs pair the artistic and the tasty. Segan says that in Elizabethan fine dining each course should have an element of surprise. The surprise here is the juicy-sweet pop of a grape hidden in the center of the savory. I have modified the recipe to emphasize the color of the “pears” and, thus, enhance the element of surprise. They go well served over white rice with a saffron cream sauce (a simple béchamel cooked with a few saffron threads). Beat the egg with the saffron threads and let steep until the egg is deeply colored by the saffron. Combine the ground meat, breadcrumbs, egg, thyme, parsley, and salt in a bowl. Make sure the mixture is evenly colored. Divide the mixture into 12 equal portions. Wrap each portion of meat around a grape and form a pear shape. Refrigerate, covered, if not ready to cook them immediately. If refrigerated bring them to room temperature before cooking. Preheat the broiler. Place the “pears” upright on a well-greased pan. Broil 4-5 inches from the heat for 4-6 minutes, or until done, rotating the “pears” during the cooking process to be sure of even cooking. You are aiming for a light stippling to imitate a speckled pear. Using a toothpick, gently embed a sage leaf into the top of each pear.